Tonight's review is for a stamping company that's making a huge name for itself in the blogging community. MoYou London. This UK-based company has outdone itself, and creates unique and truly amazing stamping plates. Their patterns are intricate, but so well carved out into the plate, that stamping is a cinch. These mural plates may be unnerving at first, but Marta at Chit Chat Nails offers great advice for getting a good design from them here! All the Parisian flair sent thoughts of gold and black through my head. 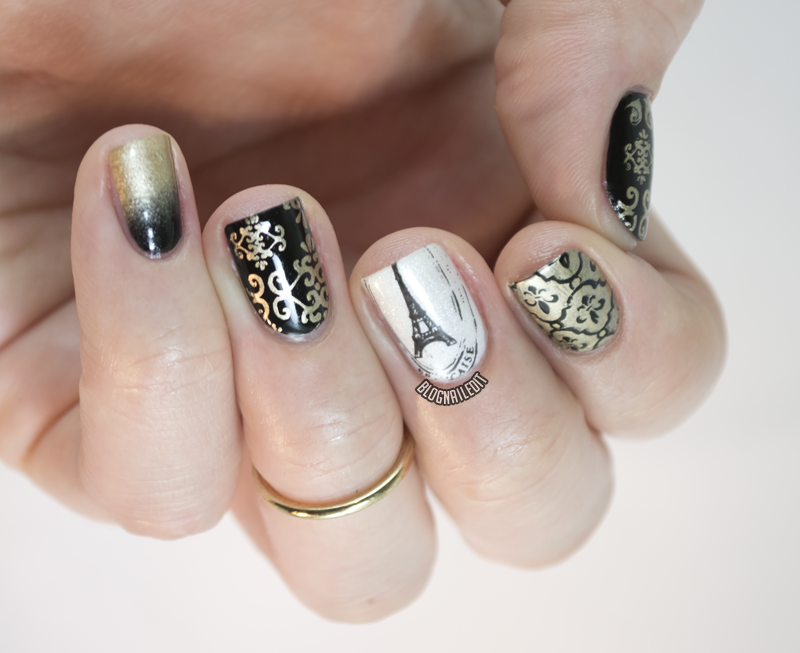 Now, since I've never been to Paris, this may be a false interpretation, but it sure looks nice on nails! I used Passion (China Glaze), Black Onyx (OPI) and Au Champagne (ORLY). I used three images from the plate, and they all transferred really easily...on the first try! That's unheard of with stamping (or at least my experience with it lately). The plates' carvings are perfect. The depth is enough to capture insane detail (note the Eiffel Tower) and hold the polish really well. In the Eiffel Tower image, the rings around the tower are meant to be patchy, giving it a sort of vintage stamp look. I love the girth of the one side of the stamper, and the detailed side is a great size as well. The swiper on the right was a little uneven, so I filed it down with a buffer so it was all even. The one on the left was perfect! I look forward to trying more of these plates, and encourage you to try them yourself if you're looking for a good set of plates. They are roughly $8 (translated from the British Pound) and can be purchased through the MoYou London online store, or if you'd rather see the prices in US dollars, you can also find them on Amazon. Shipping will be the same regardless of where you order from though. They also sell rhinestones and accents, as well as a few lacquers! These products were sent to me by MoYou London. The reviews are based entirely on my experience with the products and were in no way influenced by anyone. Really nice post. I have the tourist plate no 07 xl and I love it. Please can you give me the name of the golden polish you have used for stamping? I cant get my hands on really good one, and I love the color. Whoops! Totally meant to post that. It's called Passion from China Glaze. 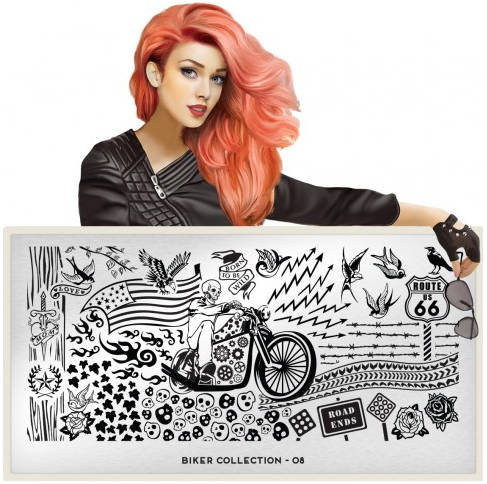 do you know of anywhere in the US that sells them? I've seen a lot of blogs about them and they look fantastic, but I can't see ordering them from the UK. I absolutely love this manicure! I'm a total sucker for anything Paris-related. Oh gurl we both got hit with MoYou Paris-piration! (that was supposed to be a combination of Paris and Inspiration, but looks more like "perspiration". Wut?) You have the PERFECT plate for it, though! I got some of these for Xmas and I love them, but I think my Konad stamper is small and inadequate. Might have to upgrade. I think these plates are really going to ignite my stamping fire! It's an affliction I'm willing to let fester. MoYou's awesome for stamping! I've never heard of your blog, but I've loved reading it so far (all 10 minutes I've been reading it). Clients in nail school LOVE their Gelish, so seeing your designs and hearing about how you achieved it is very helpful. Thanks for the follow, and thanks for your work! love this mani! seems very romantic! This looks like a great plate! I love the pattern images, and the Mona Lisa image looks gorgeous! Hello!!! Someone knows where the discount code is obtained for moyou? I love this manicure. Funny and elegant a the same time! Great job!